Gukbab literally means soup with rice, which is a way that some Korean stews are meant to be had, by mixing the rice through the soup and eating the whole thing together, almost like an instant version of congee. I had the dish a few times when I travelled to Korea (blog posts coming in March! ), and was excited to see a restaurant in Melbourne that specialises in it. It’s easy to miss the restaurant, with no clear signage and being scattered in the same building with a few other restaurants each with bigger signs. However, once you enter through the glass doors, the strong scent of sizzling bulgogi and Army stews will let you know that you’re in the right place. The free banchans consisted of a pasta salad, pickled onion, and your obligatory kimchi. Nothing out of the ordinary here, and they were all fun to munch on after we placed our order. Despite there being plenty of soups and stews that were harder to find in other Korean restaurants, we ordered the classic kimchi jiggae on this occasion. I make kimchi jiggae quite often at home, especially during Winter, but this was definitely better than my homemade version. It had a great depth of flavour in the soup itself, that’s made up of more than just kimchi and gochujang, which made for a great base for the sweet potato noodle and pork in the stew. Japchae is a common Korean dish that is essentially stir fried sweet potato noodle with thinly sliced veggies, including capsicum, carrots, black fungus, mushrooms and beef. The slippery sweet potato noodles were sweet and salty, with a strong sesame flavour from the ample use of sesame oil, a staple in Korean cuisine. Despite this being a quite pedestrian dish usually, I actually really enjoyed it. The fiery colour of the stir fried chicken caught our eyes first, and this was actually quite spicy. The chicken pieces were quite tender, and the cheese toned down the spiciness slightly. The strong spicy flavour meant that it was a great dish to have with a plain bowl of rice, but if you can’t handle a lot of heat, I’d say give this a miss, or be prepared to be drinking plenty of water after every bite. Everything that we tried at Gukbab was quite authentic, and the restaurant is great for a bigger gathering, given the extensiveness of the menu, ranging from stews, fried chicken, bibimbab, hot plates and even bingsu! The byu-dagi guk bab is said to be the signature dish of the restaurant, and I definitely look forward to trying it out on my next visit, just gotta wait until the 40 degrees days are over. Gukbab is located on Little Lonsdale Street, just two minutes walk away from Flagstaff station. Some food trends come and go, but Korean fried chicken is here to stay, and I’m all for it – nothing brings satisfaction to the table quite like a plate of greasy chicken. While there are some promising restaurants that can always be counted on, I had wanted to try out Goodovening for a while now. The restaurant had been packed on the few times that I had walked past, so we made sure to book beforehand. The outdoor seating area was reminiscent of restaurants scattered on the streets of Seoul, being slightly elevated, lit dimly and the tables are set under clear covers, which means diners can sit outside all year round. I have no idea what these were, and it’s hard to describe the taste. They were sort of tasteless to be honest, and quite hard, but were fun to nibble on nonetheless. We finished chewing on these quickly actually, and the waitress was more than happy to bring us more without us having to ask. Of course, we had to test out the benchmark first with some fried chicken. The batter looked promising, and indeed had that light airiness that I have become accustomed to. We chose soy garlic for the flavoured half, and although the chicken had less sauce on it than other places, they were sweet and tangy, and the crispy batter was not compromised at all. The chicken came with a cabbage coleslaw and we also order some chips ($5.00) with it, because hey, if you’re going to be frying chicken then you might as well fry some potatoes on the side! Cheese make any food taste better, and Koreans are known for putting cheese over absolutely everything. The spicy chicken pieces were very punchy and had a nice kick to it, and the cheese added some creaminess to the dish. Although nothing out of the ordinary, these rice balls were adorable and fun to eat with the chicken, and also helped to tame down the spiciness when needed. We’ve gone all out at this point, so what’s one more chicken dish? Carbona chicken is exactly as it sounds; the pan was filled with boneless fried chicken, fries and cabbage, all served on top of a thick and creamy carbonara sauce. This was indulgent to say the least, with the crunchy chicken paired especially well with the richness of the sauce. We all thoroughly enjoyed each and every bite of this. The dinner actually turned out to be a surprise birthday dinner for me, my friends had bought me my favourite cake from Bibelot, and it was a really enjoyable night for all of us. My friend had asked one of the waiter to put the cake in the fridge at the beginning of the meal, along with some candles. At the end of our meal, the same waiter came out and plopped the cake box in the middle of the table, without opening the box or clearing out our chicken bone filled plates first. I was so confused by this point, and my friend had to ask him to bring out the candles and a lighter in two separate attempts. I mean it was a little odd, but we all had a good laugh about it. It probably just came down to a matter of miscommunication, but I guess just make sure that you ask the waiter to bring out the cake more clearly if you were also celebrating a birthday? We tried out three styles of chicken at Goodovening, and maybe that seems like a lot, but the extensive menu actually made it really difficult to narrow our choices down. I’m definitely looking forward to returning, although it’ll be hard to not order the Chicken Carbonara again, I will try to venture out and try out some of the other chicken dishes on offer. Goodovening is located on Queen Street, get off at Flagstaff station and the restaurant is around seven minutes walk away. 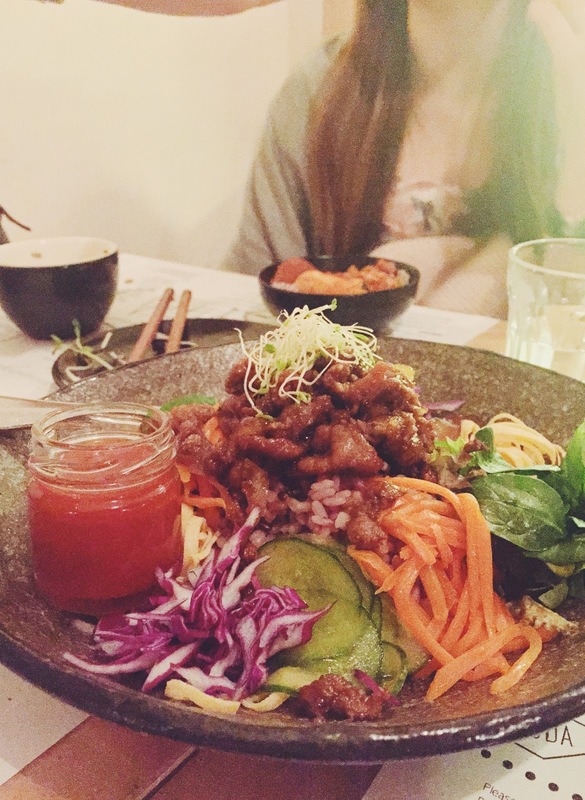 Korean food has slowly but surely made its way to my top three favourite cuisines, it’s just so versatile! 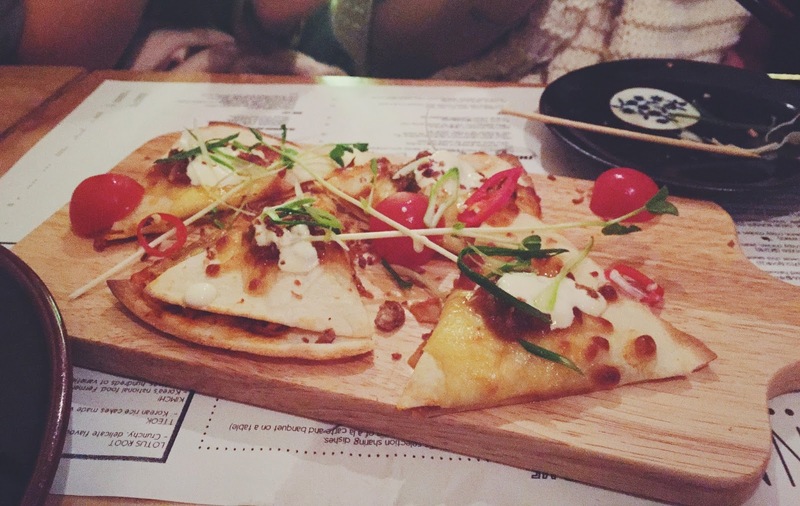 Their passion for everything cheese is also a plus, and along came Oh Deer, a Korean fusion restaurant serving up a range of specialty food that are hard to find elsewhere in Melbourne. We were given a menu to browse through, but we had out mind set on the Molton Cheesy Pork Rib set, which came with the pork ribs, kimchi fried rice, and two bowls of miso soup. The miso soup looked promising with its cloudiness, and tasted quite pleasant. Onto the star of the show, the pork ribs! The waitress put a gas stove top on our table, and placed the big stone pot on top. After a while, the cheese started melting, and she checked on us regularly, and cut the ribs up. Banchan came in the slots on the outer edge of the stone pot, and were cooked in front of our eyes too. There were corn with mayo, omelette, tteokbokki, and mashed sweet potato. My friend and I both really enjoyed the sweet potato. However, I think because the stone pop is larger than the gas top, not all the banchans were heated evenly. After the cheese had completely melted, the waitress came once again, and wrapped the cheese around the pork ribs. The pork rib did not have a lot of meat, but the sauce was very flavoursome, and the cheese added some creaminess and complimented the sweet sauce quite well. After all the cheese was used up, the waitress cooked the kimchi fried rice with the leftover sauce from the pork ribs, and although there were not a lot of kimchi, it was still tasty and filling. I think for me, Oh Deer stands out with its novelty, but the food were of average quality overall. If you’re wanting to try something different then go ahead and give it a shot, but otherwise, I’d sit this one out. 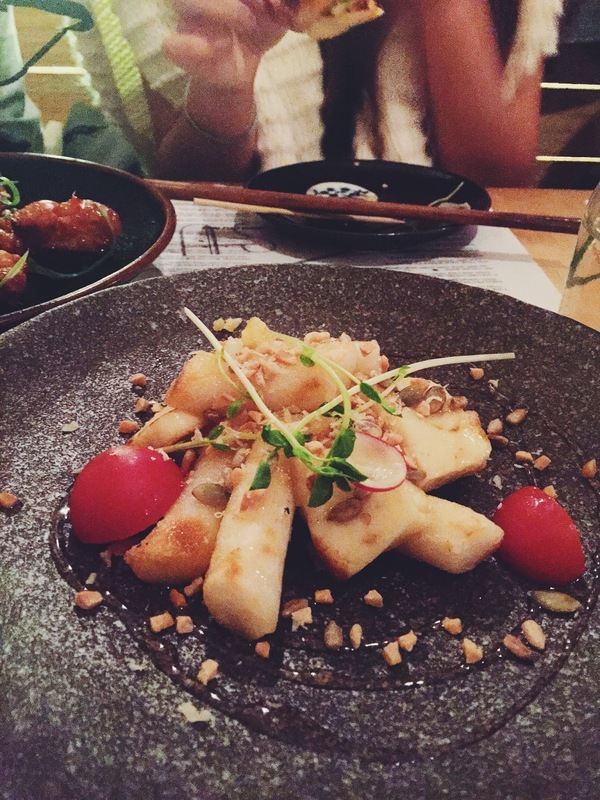 Oh Deer is located on Royal Lane off Chinatown, less than ten minutes walk away from Flinders St Station. Endless choice of meat and fun DIY, what’s not to love about Korean BBQ? I mean okay, the smell lingers for days, but that’s a price worth paying for. Palsaik specialises in Korean BBQ, and has been around for a while now, and I finally made it down there one Monday night with a friend. The interior was a lot sleeker than I expected, mood lighting all around (which means bad photos unfortunately), and there was plenty of tables. The whole space looked more spacious than Korean restaurants I’m used to. We get the all-so-famous Palsaik set, also known as the 8 flavour pork belly set! The set included 8 different flavours of pork belly (duh); wine, original, ginseng, garlic, herb, curry, miso paste and red pepper paste; as well as a seafood and soybean paste stew, two steamed rice, and assorted vegetables. The stew was quite flavourful, and had prawns, mussels and calamari rings. There was also some lettuce, as well as kimchi, spring onion salad, pickled radish and pickled onion, so that you can wrap up the pork belly in the lettuce, and a combination of whatever sides you fancy. But let’s be real, the best part about Korean BBQ is all in the cooking! The sizzle of the meat, and watching them caramelise, it’s just such a satisfying experience. Out of the eight flavours, my personal favourite was garlic and red pepper paste, the garlic was, well, garlicy and delicious, and the red pepper paste lent the pork belly some spiciness, which almost always gets a tick in my book. We all know the real purpose of those vegetables – to make us feel good about ourselves for eating vegetables, and hey, they did their job. 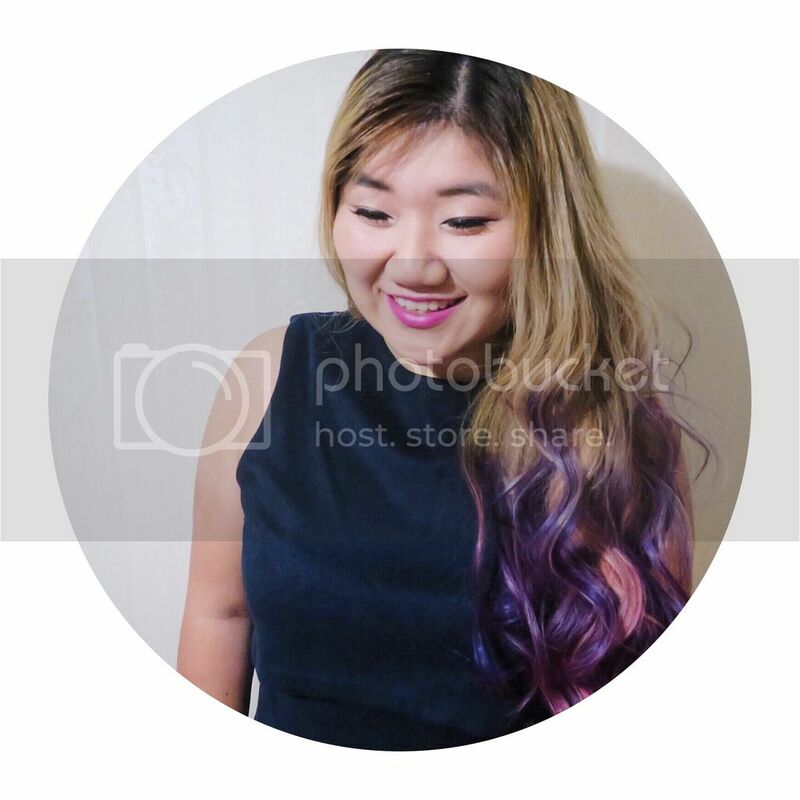 Although I much prefer having Korean BBQ at home, if you do want to head out into Town for some Korean BBQ, then Palsaik is definitely a great choice! With a decent selection of meat, and a great atmosphere, it’s suitable for both small and large groups. 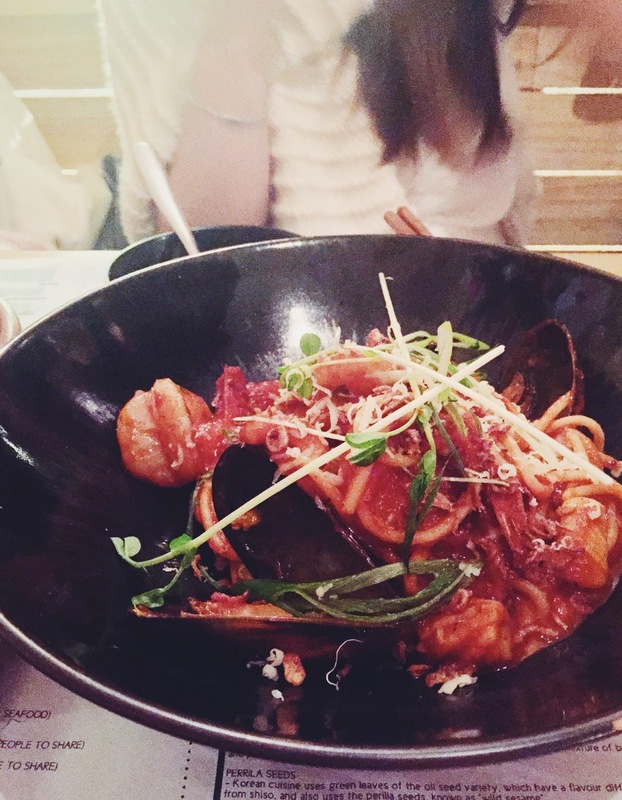 Palsaik is located on Little Bourke Street, around 10 minutes walk from Melbourne Central. Instead of me whining about how hard law school has been for the hundredth time, let’s just get onto the review. Bon Chicken & Beer is a new eatery on Kingsway, there are already some great Korean restaurants in the area, however, none of them specialise in Korean fried chicken, something that I crave from time to time. The restaurant was quite small, but the service was friendly and we were sat down promptly. Instead of the usual banchan, salad and pickles were served alongside the fried chicken. The salad was kind of like a coleslaw, and had plenty of spicy mayo on top. The pickled radish was very refreshing, and did help to prevent the other dishes from being too cloyingly heavy. 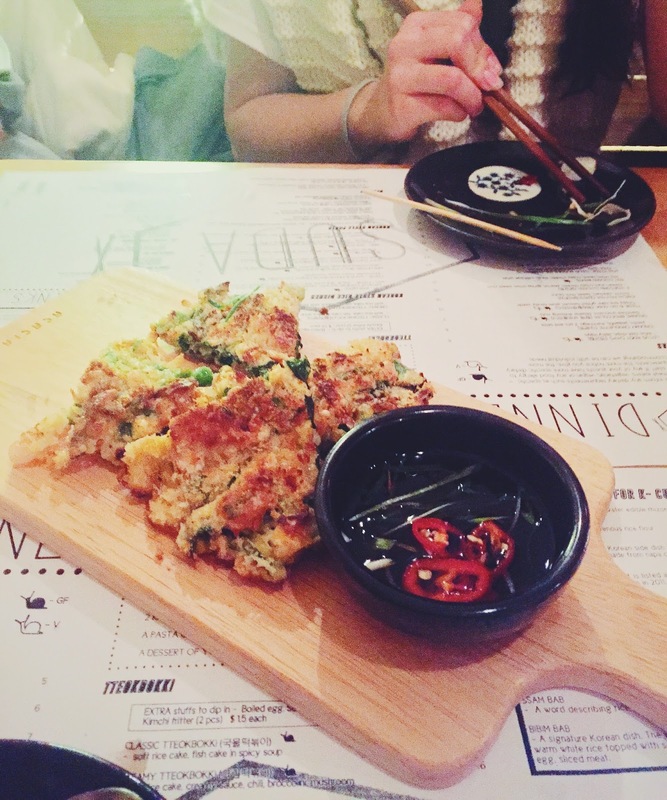 We started off with a classic, kimchi pancake. The kimchi pancake was not as crispy as I like, however, this is probably due to the amount of kimchi that was in the dough, and the fact that it’s not overly oily, like my favourite rendition of the dish from Joomak. The sauce in the middle was very salty though, you only need the tiniest bit for some extra flavour. Another crowd favourite is the tteobokki. For those of you unfamiliar with the dish, it’s basically cylinder shaped rice cake stir fried in a sweet and spicy sauce with vegetables, fish cake, and some ramen thrown into the mix. Although nothing out of the ordinary, this was very comforting to nibble on. For those of you who are as indecisive as me when it comes to ordering, the half and half is such a God send. The chicken had a super crispy batter which I loved, and my favourite out of the two was the soy garlic, it had the perfect balance of flavour, and the chicken was extremely tender. The sweet chilli was great too, however, there a little too much sauce for my liking. Although Bon Chicken & Beer opened not too long ago, it was already pretty busy, clearly people can never say no to fried chicken on a cold Winter night. If you’re wanting to try some chicken that’s not from Gami, then Bon might be where you should head to next, some of my friends actually prefer the chicken at Bon better, if that’s any indication. 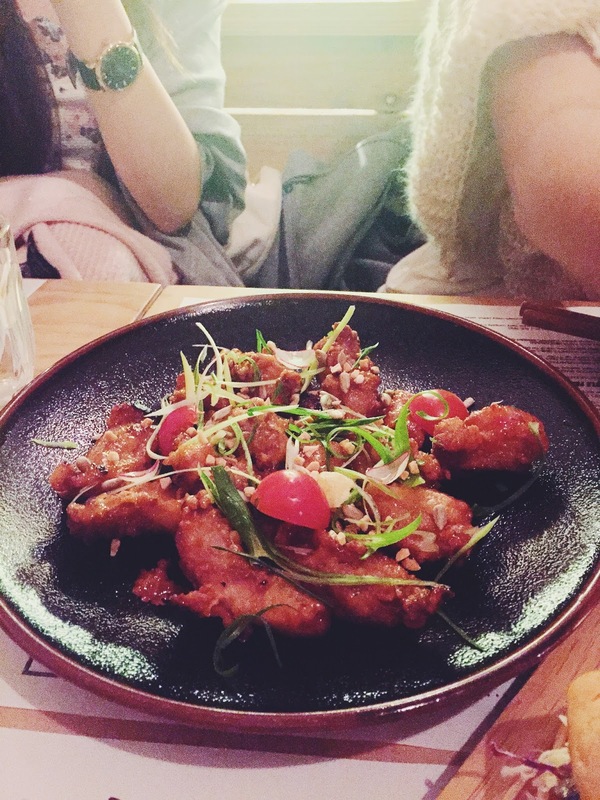 Bon Chicken & Beer is located on Kingsway in Glen Waverley, just 5 minutes walk from Glen Waverley station. I’ve been wanting to go to Suda for the longest time, so when my friends all felt like Korean food (like always), I jumped at the chance and took them to Suda! It may seem unassuming from the outside, but once you get in, the warm and friendly service made us feel at home straight away. And because all the items sounded so enticing on the menu, we went for the Feed Me option, pay $29 and experience a 11 course Chef’s selection sharing dishes. The banquet began with a simple soft tofu salad. 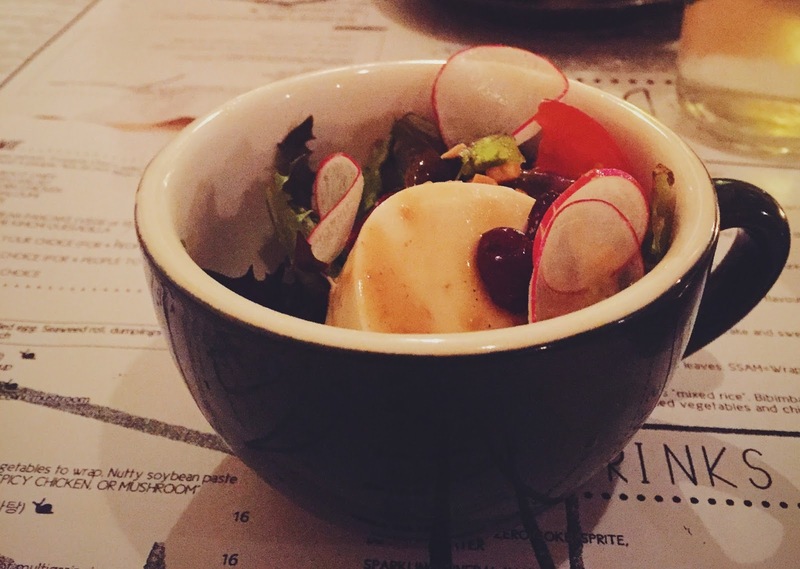 The salad dressing was tangy and light, making it a great palate cleanser. 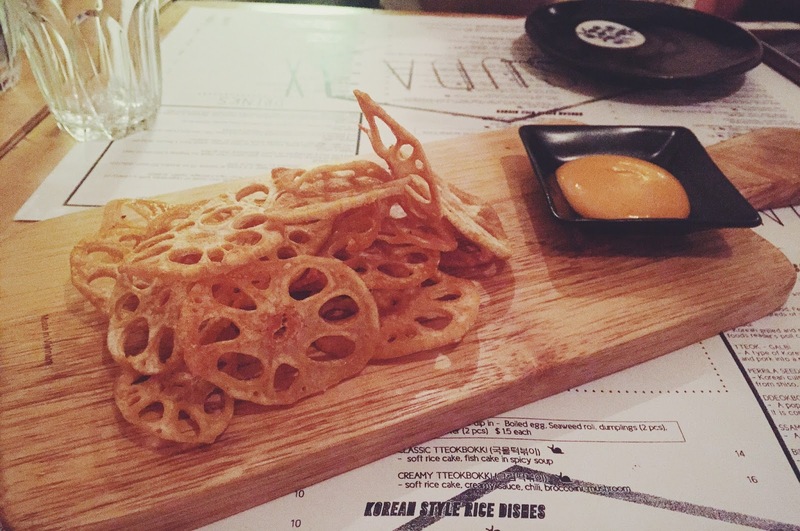 These lotus root chips may seem simple, but they were down right addictive. The sauce on the side kind of reminded me of a chipotle sauce, although it didn’t elevate the chips, but if you were into sauces it would be right up your alley. 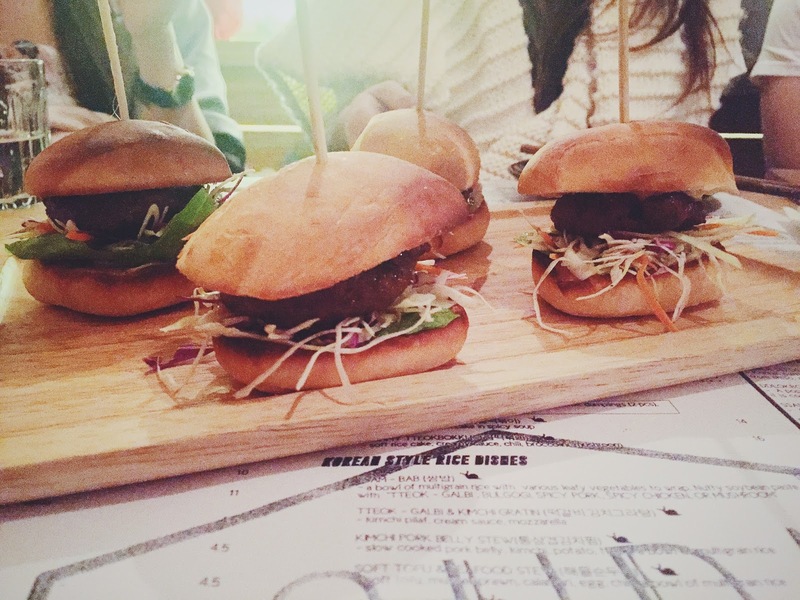 The burgers were served between a ciabatta-esque bun, and the beef patties themselves had a distinctive bulgogi flavour, which we all adored. The coleslaw was crisp and refreshing, making it the perfect burger to snack on. The large chunks of popcorn chicken had a sweet glaze coating, and it was again, very delicious. The chicken was tender, and the pieces of peanuts that are scattered throughout the chicken gave it even more crunch factor. The tteokbokki was coated in honey after being fried lightly, and it offsets the unami from the haloumi perfectly. It may sound like an unusual combination, I mean, it’s definitely not your everyday tteokbokki doused in sauce, but it was probably my favourite dish of the night! 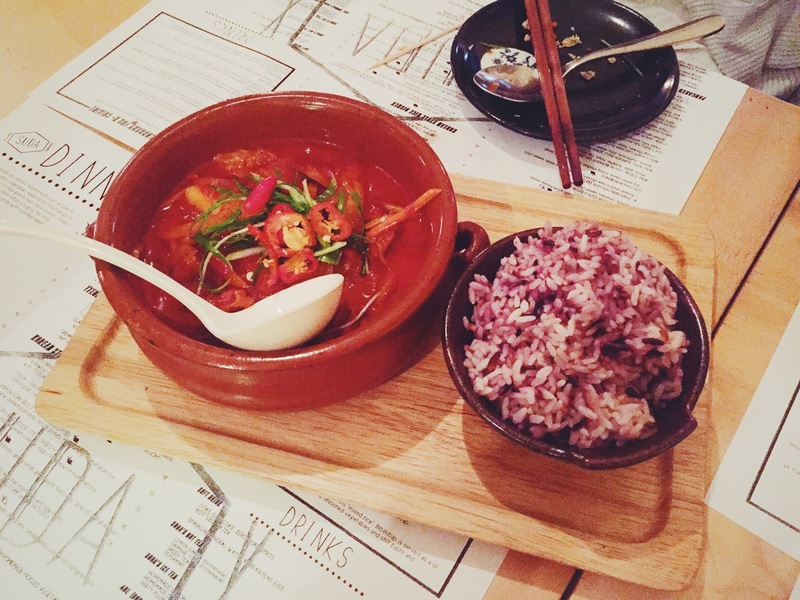 Korean and Mexican fusion seems to be creeping up in Melbourne, and I can certainly see why. Chuck some crunchy and acidic kimchi between some warm and crispy tortilla, and the result can be pretty amazing. There was also a light drizzle of sour cream over the quesadilla, bringing more Mexican-ness to the dish. These Korean pancakes were definitely a lot more healthier than what I’m used to. The pancake was comprised mainly of various forms of vegetables, and held enough by just enough batter so that it could maintain the shape. It was definitely a light take on a classic! The stew was exactly what we needed on a cold night. The large chunks of pork belly was extremely tender, and took on the kimchi flavour really well. We fought for the sauce too, because it tasted so good poured over the multigrain rice! This was probably the least Korean dish of the night, but it was tasty regardless. The spaghetti was cooked to al dente, and the chilli sauce definitely had a kick to it. All the seafood, including prawns, mussels, fish and scallops, were cooked perfectly too. Instead of a hot stone pot, the bibim-bab was served almost like a salad. After mixing the vegetables, meat, and rice together, with generous dashing of the sauce, the bibim-bab was full of both texture and flavour. But to be honest, I prefer the traditional version better, just because I can never pass up on the crunchy rice at the bottom of the pot, or the soft gooey egg. After all that, it was finally dessert time! This reminded me of red bean pancakes that are served in Chinese restaurant, but with a much crispier exterior. The combination of vanilla ice-cream, salted caramel, and peanuts was a timeless classic, and we cleaned off the plate even though we were so full already! 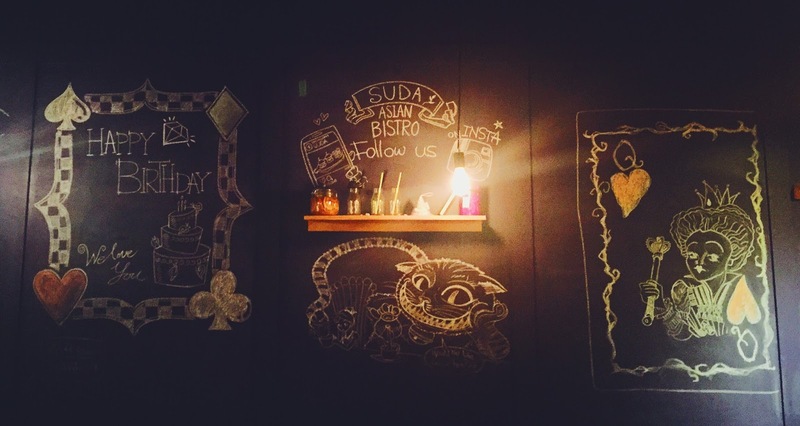 I thoroughly enjoyed my dining experience at Suda. 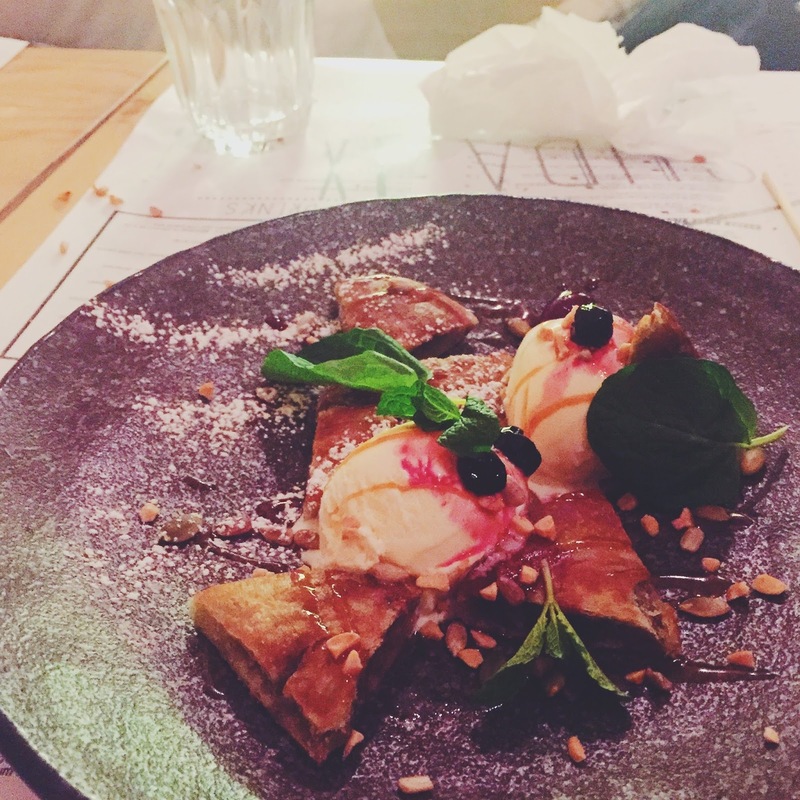 The food was interestingly different, the staff was attentive and welcoming, and the ambience was lovely. Although small, it was not packed when we visited, which I gotta say, is a relief, after all, how often can you visit a restaurant that’s above par in Melbourne without waiting in line for a ridiculous amount of time? Taking a modern spin on traditional cuisines can be risky, but Suda served up dishes that I would happily return for. Definitely a hidden gem in the city! 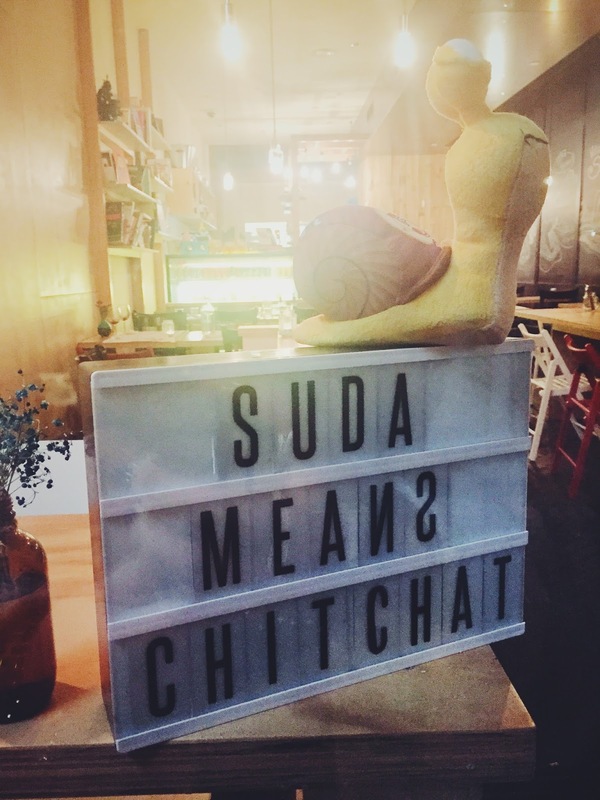 Suda is located on Lonsdale Street, around ten minutes walk from Melbourne Central.